The addictive novel about four young friends navigating the cutthroat world of classical music and their complex relationships with each other, as ambition, passion, and love intertwine over the course of their lives. Aja Gabel's writing has appeared in BOMB, The Kenyon Review, Glimmer Train, and elsewhere. A former cellist, she earned her B.A. at Wesleyan University, her MFA at the University of Virginia and has a Ph.D. in Literature and Creative Writing from the University of Houston. Aja has been the recipient of fellowships from the Sewanee Writers'' Conference, Literary Arts Oregon, and the Fine Arts Work Center in Provincetown, where she was a fellow in fiction. She currently lives in Los Angeles. 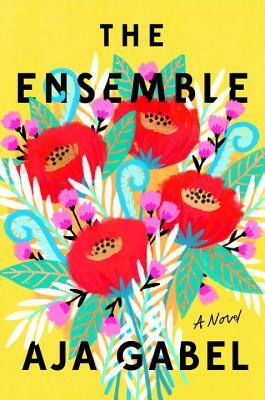 A BOOKLIST "TOP 10 FIRST NOVEL"
"Aja Gabel's powerful debut offers a sensitive portrait of four young musicians forging their paths through life: sometimes at odds with each other, sometimes in harmony, but always inextricably linked by their shared pasts." "With uncommon clarity and empathy, Aja Gabel brings us inside the passionate, complex, and sometimes cutthroat intimacy that exists among the four members of a string quartet. A wise and powerful novel about love, life, and music. I didn't want it to end." “The Ensemble deserves a standing ovation. A gripping tale of four musician's journeys through discord and harmony, life and love. Aja Gabel is a brilliant young writer with the rare gift of an old soul." "I often admire novels that are platforms for their writers' own stories, upon which their own singular character, with its own singular history, is carefully incised. This, however, is a novel of a different, more expansive, and altogether more electrifying kind. Aja Gabel contains at least four complete human beings inside her, and I'm guessing countless others. She knows these people down to their cells, and she gives all of herself to them."